Basement membranes likely modulate fibrosis triggered by diverse injuries in many tissues such as lung, skin, and kidney by modulating the availability and function of pro-fibrotic transforming growth factor (TGF) β, platelet-derived growth factor (PDGF), and other modulators. This concept has recently been conclusively demonstrated in the clear anterior wall of the eye called the cornea, where injury and defective regeneration of the epithelial basement membrane (EMB) trigger myofibroblast development and fibrosis (“haze,” Fig. 1) in the anterior corneal stroma. Similarly, Descemet’s basement membrane (DBM) in the posterior cornea beneath the corneal endothelium is a barrier to TGF β entry into the cornea from the anterior chamber of the eye and damage to DBM triggers myofibroblast development and fibrosis in the posterior cornea. Fibrosis occurs in virtually every organ in bodies of humans and other animals. When this process is studied, a frequent question arises regarding the origin of the myofibroblasts that appear, proliferate and persist to produce the excessive and disordered collagens and other extracellular matrix associated with fibrosis. For example, an entire field has grown around epithelial–mesenchymal transition (EMT) as a source of myofibroblasts from epithelial cells in lung, liver, and other organs. In the cornea, however, our prior studies have shown most myofibroblasts develop from keratocytes (resident fibroblastic cells in the corneal stroma) and bone marrow-derived cells. Fibrocytes are bone marrow-derived mesenchymal progenitor cells that circulate in blood and migrate into tissues to differentiate into fibroblasts and myofibroblasts in response to injury. Fibrocytes express CD34, CD45, collagen type I, vimentin and other markers. The present study demonstrated conclusively that a high proportion of myofibroblasts that develop in the cornea after scarring injury were derived from fibrocytes by first generating chimeric mice by transplanting bone marrow from green fluorescent mice, in which all cells in the body express a green fluorescent protein (GFP), into irradiated normal mice. 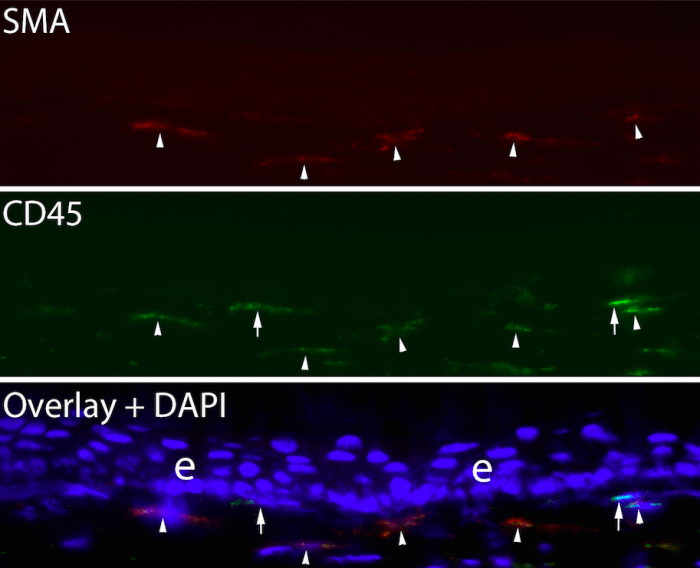 After allowing the transplanted bone marrow to mature for one to two months, and verifying at least 95% chimerization of the mice using fluorescent cell sorting, the corneas had scarring injuries produced by ablating the corneal surface with an excimer laser through a fine screen to produce an irregular corneal surface (irregular PTK). 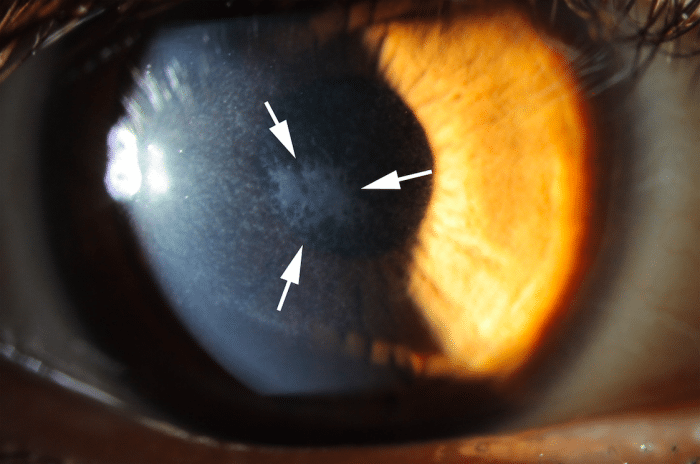 After this injury, any cell that enters the cornea that is GFP+ is known to have originated from bone marrow-derived cells and to have entered the corneal stroma from the blood vessels at the periphery of the cornea (limbal vasculature). At time points from 1 day to 21 days after surgery—while scarring was developing in the corneal stroma—animals were sacrificed, and multiplex immunohistochemistry was performed for GFP, CD34, CD45, vimentin and the alpha-smooth muscle actin (SMA) marker for myofibroblasts. Fibrocytes were shown during this period to develop into mature myofibroblasts in the stroma, with many of the SMA+ myofibroblasts retaining CD45 expression at 21 days after injury (Fig. 2). SMA+ myofibroblasts that were GFP- were also CD45-, and likely developed from resident keratocytes. This study also showed that many fibrocytes underwent apoptosis during their development before they became mature myofibroblasts, presumably because TGF β levels in the stroma were insufficient to support their continued viability and development. Other studies in our laboratory have shown that the proportion of myofibroblasts in scarred corneas that develop from bone marrow-derived cells varies from 30% to 70% in individual animals, with the balance of the myofibroblasts being derived from keratocytes. Proteomic studies are currently in progress to determine how mature myofibroblasts derived from these two precursors differ in protein expression and function. The approach used in this investigation to study myofibroblast development from fibrocytes in the cornea is likely to be useful to study the role of fibrocytes in fibrosis in other organs. 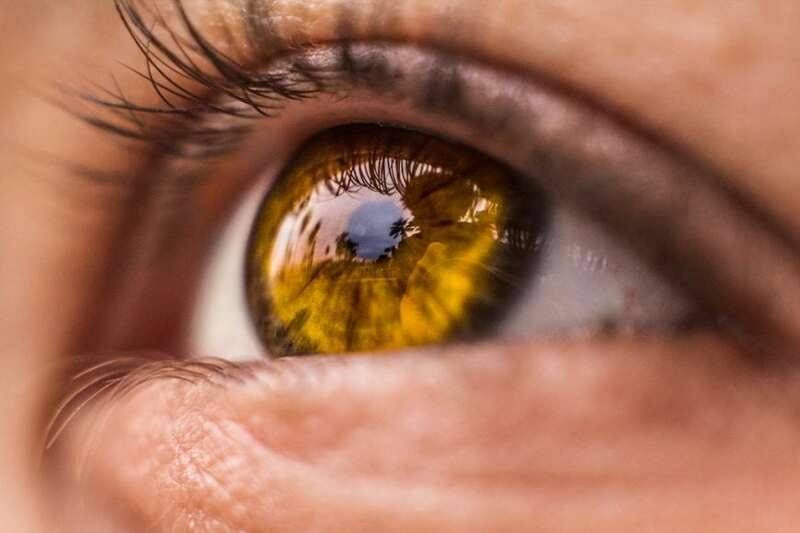 These findings are described in the article entitled Fibrocyte migration, differentiation and apoptosis during the corneal wound healing response to injury, recently published in the journal Experimental Eye Research. This work was conducted by Luciana Lassance, Shanmugapriya Thangavadivel, and Steven E. Wilson from the Cole Eye Institute, Cleveland Clinic, and Gustavo K. Marino and Carla S. Medeiros from the University of Sao Paulo.